Create several lanterns and use them to decorate your daycare. 1. Gather your material. 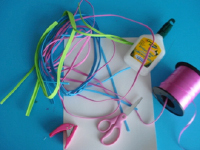 You will need white cardboard, colourful ribbon, colourful Fun Foam strips (dollar store), a hole-punch, scissors, and glue. 2. With the white cardboard, form a cylinder. Glue the ends together. 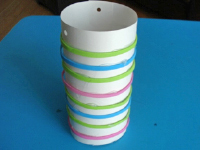 Use the hole-punch to make three holes at the top of the cylinder. 3. 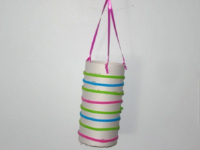 Wrap the Fun Foam strips around the cylinder to represent the folds we normally see on paper lanterns. If you wish, ask older children to create a color pattern. 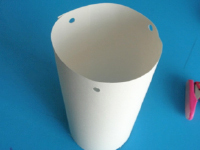 Younger children can simply draw on the cardboard before forming the cylinder if you prefer. 4. Cut four pieces of ribbon of the same length. Thread three pieces through the holes at the top of the cylinder and tie a knot. Gather all three ribbon pieces and knot them together. 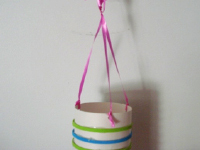 Attach the fourth ribbon and create a loop that can be used to hang your lantern. Curl the ends of the ribbons if you wish.